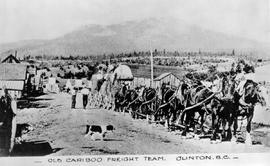 "Quartz gold mine, Wells, BC". "Steeple Rock on the west shore of Chilko Lake; Coast Range in the distance; Chilko Lake nearly 70 miles in area, 40 miles long and very beautiful". "The Capstan at work, Cottonwood Canyon"; sternwheeler Charlotte navigating Cottonwood Canyon, Fraser River. "The Hoodoos, Merritt-Spences Bridge Highway, BC." 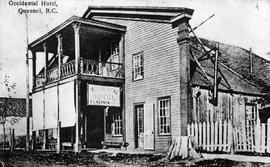 "Theatre Royal, Barkerville; LaFont and Ward's Troupe...."
"Toy", a Keithly Creek celebrity. "Twilight Lodge, Lac La Hache." "Warehouse, Cottonwood Canyon Lower Entrance"; sternwheeler Charlotte navigating Cottonwood Canyon, Fraser River. "Where line is picked up, Cottonwood Canyon"; the sternwheeler Charlotte navigating Cottonwood Canyon on the Fraser River. "Williams Creek, Barkerville, BC"; MS-0676, Box 3, File 19.